Back when Spotify officially arrived in the Philippines in April of 2014 one of its promos for the premium subscription was free trial for only seven days. I can clearly remember that because I immediately took advantage of it as soon as I signed up for an account. After that, various promos have been launched by Spotify Philippines to encourage Pinoy users to try the premium package that offers a ton of convenience and much nicer experience especially if they are listening to music using their mobile phones or on the go. 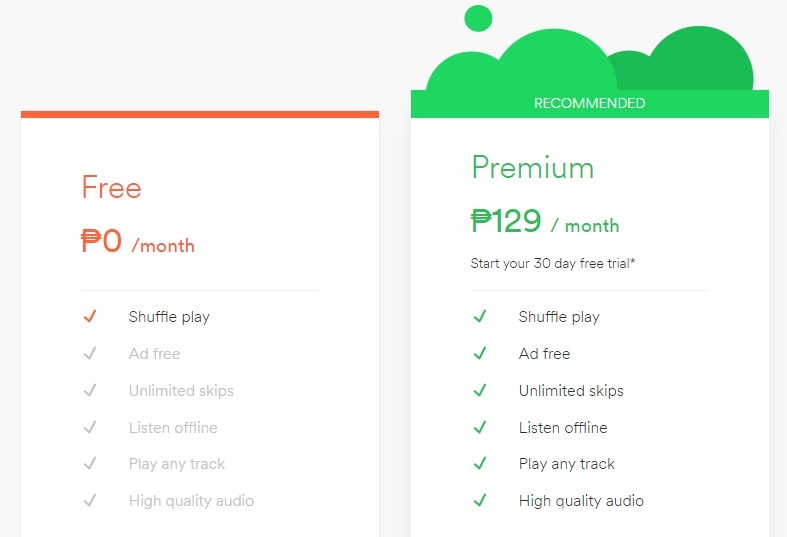 In case you have been wondering what are the differences between the free Spotify subscription versus the premium. See chart below which I grabbed straight from Spotify's website for a much clearer comparison and illustration. Some of the follow up Spotify promos that I can remember are the Php9 for three months that was launched in November of 2015, then there's Php49 for three months as well, Family Premium Plan for as low as Php194 a month which is good for up to 6 users in the family, and so many others. And today, I happened to visit Spotify website on my desktop browser to check out what's the current promo for Spotify Premium they are offering and I was surprised to see that first-time Spotify Premium users can have a free 30-day trial. Yes 30 days of free Spotify Premium! So what's the catch? Well, there is actually no catch and you won't be billed for the succeeding months if you will cancel your subscription on or before the free trial expires. But should you wish to proceed with your Spotify Premium account, it will cost you only Php129 per month or about Php4.00 a day. Unfortunately, this promo is not for everybody. Spotify said that the 30-day trial is only for those users who have not tried the premium before nor taken advantage of any of the previous promos. Meaning to say, your Spotify account should be a either a fresh sign up or has been in free mode since you created your account. The rest of the terms and condition for this particular promo is clearly stated on Spotify website which you can check here. You can do this by visiting the Spotify website and scroll down to the promo itself where it leads you to go premium and start your free trial. Other option is through the Spotify mobile app itself, just click on the "Your Library" located at the lower right part of the screen and then tap on the Gear icon at the upper right on the next screen.